I first sat up and took notice of Toastmasters International when I ran into the world champion of public speaking, 2014. And I was hooked! I was surprised and thrilled at the same time to see speaking being given so much importance at the international level. And this speech by Dananjaya Hettiarachchi is just so perfect! I can’t count the number of times I have watched it – it’s like a piece of art in speaking. Although, on reading further about him, I learnt that that it took him a decade to get to where he did. So, it’s true! While we see the accolades of successful people, they’ve given their lives to make it the top! 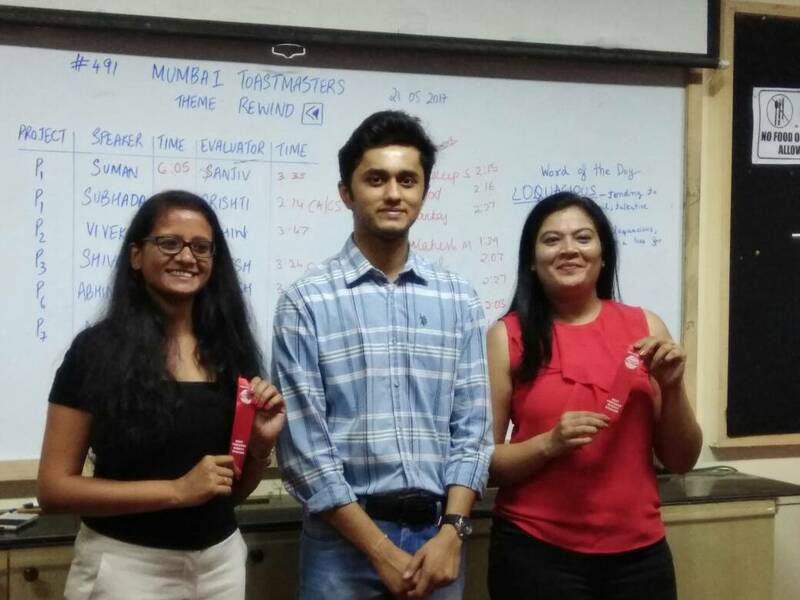 And it is truly humbling that my journey with Toastmasters has just begun. And there are so many more exciting things to come. After months of postponing – mainly because the meet happens on Sunday morning – I finally made it to the Bandra club in Mumbai. I had looked up the toastmasters website many times before and this particular club kept coming up. And one fine sunday morning, I did drag myself out of bed to make it to the meet at 9.30! The first thing I wanted to do was to kick myself for not making it earlier. For someone like me who is so passionate about soft skills, especially speaking, this was heaven – the Mecca of speaking. I loved the encouraging atmosphere. As a trainer, I’m always expected to be perfect and I take my participants towards perfection in the skills they want to master. But this is a place where perfection and experience don’t take precedence. Everyone has equal opportunity to take the stage, goof up and still be applauded! An ideal and fun learning space where people are free to make mistakes and grow. I took no time in making my decision and joined the group. Toastmasters helps you develop your communication and leadership skills. And one needs to complete projects that go towards it. And I looked forward to working on my first project in the communication module – which was an introductory speech. Talking about oneself can be easy and hard, at the same time. But it’s quite a challenge when one has to fit about 3 decades in 6 minutes and still make it interesting. I’m naturally confident while speaking but it’s been quite a while since I’ve delivered a prepared speech for a set time limit. And it turned out to be harder than I thought. Writing the speech: Since the topic and time limit are specific, it made sense to write the speech first rather than just have bullet points, like I usually do for training programs. But like I mentioned, fitting an entire lifetime to 6 minutes is not unimaginable. But definitely a herculean task! My first draft ran into double the number of words than required, And as someone who writes a lot, I do get attached to the written word and did not want to chop out anything. But it had to be done. Multiple drafts, useful feedback from Ganesh and some heart breaking editing led to an almost perfect draft. Practicing the speech: Now, this is something we all shy away from! Endlessly repeating a set of words isn’t anyone’s idea of fun. But did you know that it is mandatory for TED speakers to arrive early and put in hours of practice. Well, I’m not sure how many hours I put in but probably sufficient to get my speech right and make sure I stick to timelines with my rate of speech. The actual speech: Again, training a room full of people is very different from facing about 80 odd pairs of eyes staring at you! And the practice that I put in really helped to stay on course with the script and time. Video of the speech: The best part about getting on stage at Toastmasters is the video we get at the end of it. This is a great way to understand how we look, speak, present ourselves in front of people. A great tool to improve ourselves. And I could watch myself and see the how I can improve the next time. 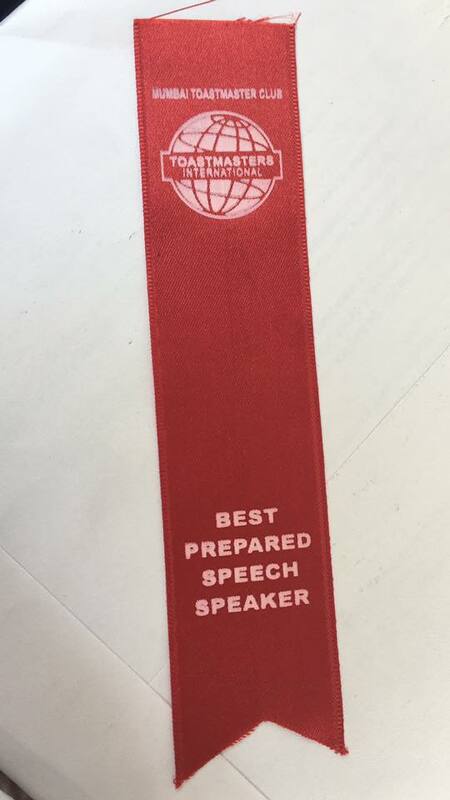 And it was a bonus to win – jointly – the ribbon for the best speaker of the day. I’m already looking forward to working on my other projects and getting better with every speech. And here’s my beautiful red ribbon! It was a great feeling to win and brought back memories of college times. When was the last time I won something!! If you want to improve your confidence in public speaking, Toastmasters is a great place to be. You can follow the link in this post for more details.